Fall injuries rank as a major health risk for retirees. Among people age 65+, 30% of people fall each year.1 This problem is even worse for seniors with dementia. For them, 50% to 80% fall each year.2,3 These falls can lead to injury and even death, as well as a reluctance to perform self-care activities. Fortunately, there are things families can do to manage this risk. Risk management starts with understanding the dementia – fall injury connection. It’s easy to imagine how dementia can interfere with activity planning and self-care tasks, and how compromised decision-making can lead to greater risk of falls. 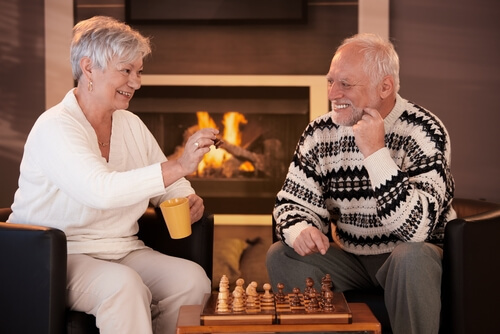 What is less commonly understood is that dementia is also connected with physical challenges. People with dementia have more problems with postural control and gait.4,5 What’s more, balance and mobility impairments are known to progress at a significantly greater rate among seniors with dementia.6 Increased fall risk among seniors with dementia comes from both mental and physical challenges, and the physical challenges get worse faster than people often expect. 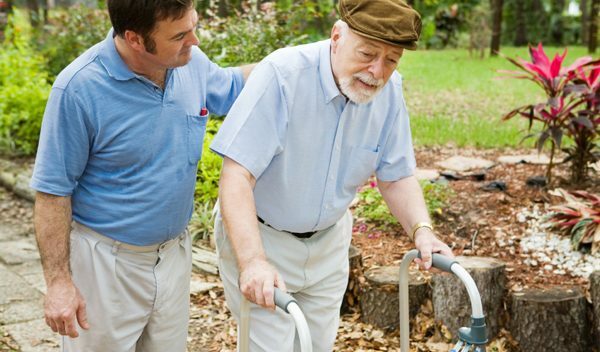 After a senior has an accidental fall, patients and their families should request a fall rehab program. Research proves these programs can reduce the risk of fall injuries, and medical guidelines universally recommend them.7 However, these studies have been based on retirees in general, not the subset of seniors with dementia. Given the additional mental and physical challenges faced by people with dementia, we cannot generalize the results of studies following people without dementia. Does Gait Rehab Work for Seniors with Dementia? To answer this question, Elissa Burton and colleagues recently published a study in the scientific journal Ageing Research Reviews.8 They analyzed and combined the results of four previous studies focusing only on people with dementia who lived at home, rather than in a nursing home. Among 243 seniors, they were able to compare the results of people who went through a fall prevention program to those who did not. Overall, the fall prevention programs reduced the risk of falls 32%. Despite these positive results, it may be helpful for families to manage their expectations. Fall prevention rehab works differently among seniors with dementia. Among retirees without dementia, rehab programs not only reduce the risk of fall injuries, they tend to reverse even long-standing geriatric disability.9 This does not appear to be the case among seniors with dementia. For them, while rehab programs significantly reduced the risk of falls, physical function continued to decline. What Should a Fall Prevention Program Include? While various healthcare providers can provide some or all of these services, Medicare-certified home health agencies can provide complete fall prevention programs including all the items above and more. 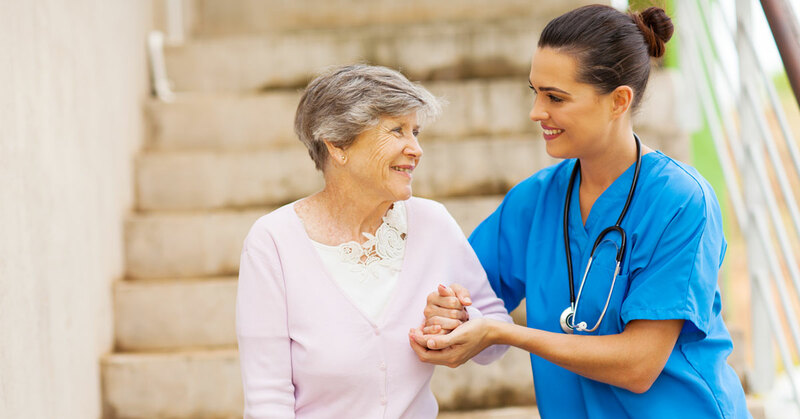 Under the general supervision of a trusted doctor, home health agencies can send nurses, physical therapists, occupational therapists, and other healthcare providers to the homes of patients. They can make multiple visits per week for multiple weeks or even months to develop, supervise, and progress fall-injury prevention programs. 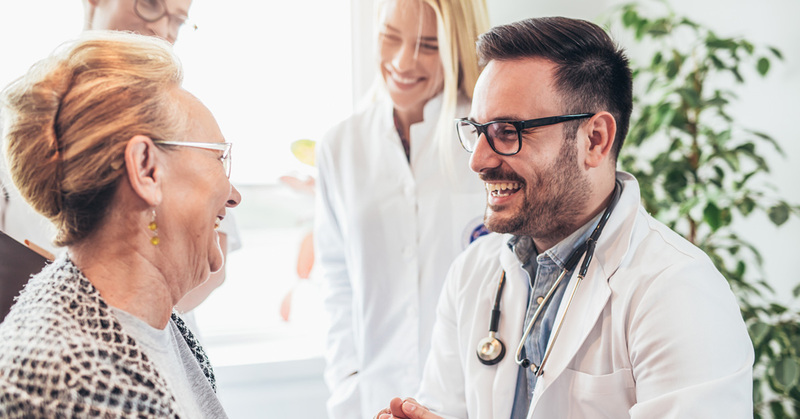 To qualify for Medicare-funded home health, patients must meet Medicare’s definition of homebound (which is not as restrictive as it sounds) and some other criteria. In conclusion, fall injuries rank as a serious health concern for retirees, especially if dementia is present. It’s important to understand that dementia increases fall risk through both mental and physical challenges. Rehab can reverse long-standing geriatric disability among retirees without dementia. For seniors with dementia, fall-prevention programs can reduce the risk of falls by almost a third, but not fully reverse physical decline. Good fall prevention programs cover many risk factors including but not limited to leg exercises. For qualified beneficiaries, Medicare-certified home health can deliver these fall-prevention programs while Medicare pays 100% of the bill. Gillespie L, Rovertson M, Gillespie W, et al. Interventions for preventing falls in older people living in the community. Cochrane Database Syst Rev. 2012; 9: CD007146. Allan L, Ballard C, Rowa E, et al. Incidence and prediction of falls in dementia: a prospective study in older people. PLoS One. 2009; 4 (5): (e)5521. Eriksson S, Gustafson Y, Lundin-Olsson L. Risk factors for falls in people with and without a diagnosis of dementia living in residential care facilities: a prospective study. Arch Gerontol Geriatr. 2008; 46: 293-306. Australian Institute of Health and Welfare. Australia’s Health 2012. Australia’s Health Series No 13. Cat No. AUS 156. Canberra: AIHW; 2012. Suttanon P, Hill K, Said C, et al. Can balance exercise programmes improve balance and related physical performance measures in people with dementia? A systematic review. Eur Rev Aging Phys Act. 2010; 7: 13-25. Suttanon P, Hill K, Said C. A longitudinal study of change in falls risk and balance and mobility in healthy older people and people with Alzheimer Disease. Am J Phys Med Rehabil. 2013; 92 (8): 676-685. Sherrington C, Tiedemann A, Fairhall N, et al. Exercise to prevent falls in older adults: an updated meta-analysis and best practice recommendations. N S W Public Health Bull. 2011; 23 (3-4): 78-82. Burton E, Cavalheri V, Adams R, et al. Effectiveness of exercise programs to reduce falls in older people with dementia living in the community: a systematic review and meta-analysis. Clinical Interventions in Aging. 2015; 10: 421-434. 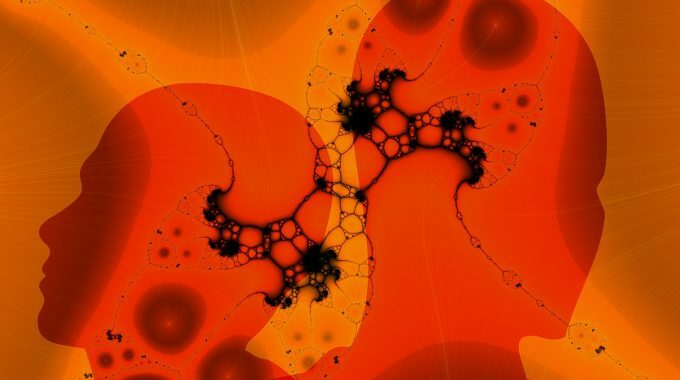 Vries N, Ravensberg C, Hobbelen J, et al. Effects of physical exercise therapy on mobility, physical functioning, physical activity and quality of life in community-dwelling older adults with impaired mobility, physical disability and/or multi-morbidity: A meta-analysis. Ageing Research Reviews. 2012; 11: 136-149.